"Gary Janetti's book is so rolling-on-the-floor funny, so brilliantly observant, and so full of heart.” — Kevin Kwan Fans of David Sedaris, Jenny Lawson, and Tina Fey… meet your new friend Gary Janetti. 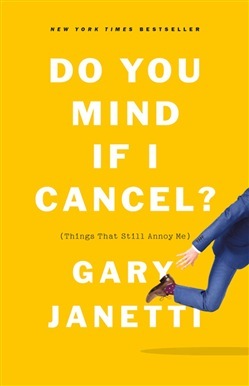 Gary Janetti, the writer and producer for some of the most popular television comedies of all time, and creator of one of the most wickedly funny Instagram accounts there is, now turns his skills to the page in a hilarious, and poignant book chronicling the pains and indignities of everyday life. Gary spends his twenties in New York, dreaming of starring on soap operas while in reality working at a hotel where he lusts after an unattainable colleague and battles a bellman who despises it when people actually use a bell to call him. He chronicles the torture of finding a job before the internet when you had to talk on the phone all the time, and fantasizes, as we all do, about who to tell off when he finally wins an Oscar. As Gary himself says, “These are essays from my childhood and young adulthood about things that still annoy me.” Original, brazen, and laugh out loud funny, Do You Mind if I Cancel? is something not to be missed. Acquista Do You Mind If I Cancel? in Epub: dopo aver letto l’ebook Do You Mind If I Cancel? di Gary Janetti ti invitiamo a lasciarci una Recensione qui sotto: sarà utile agli utenti che non abbiano ancora letto questo libro e che vogliano avere delle opinioni altrui. L’opinione su di un libro è molto soggettiva e per questo leggere eventuali recensioni negative non ci dovrà frenare dall’acquisto, anzi dovrà spingerci ad acquistare il libro in fretta per poter dire la nostra ed eventualmente smentire quanto commentato da altri, contribuendo ad arricchire più possibile i commenti e dare sempre più spunti di confronto al pubblico online.